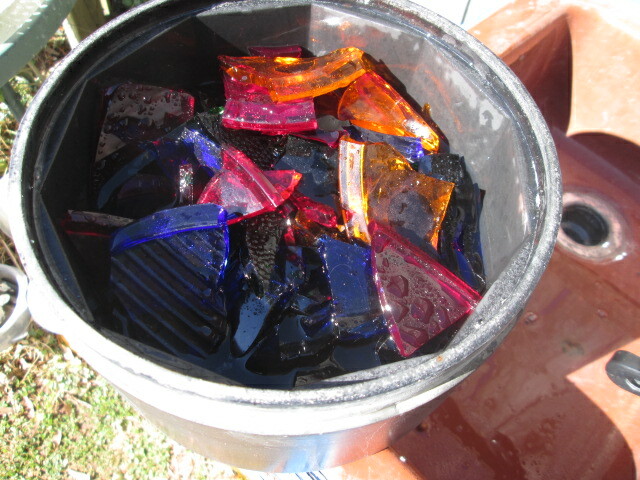 Jamesp has been inspiring me to tumble more glass because of the great results he is getting by tumbling art glass. 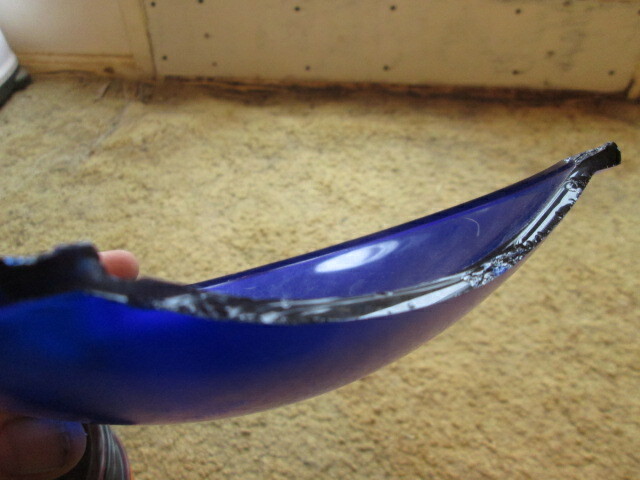 So I have been on the lookout for glass that is thick enough to work with. I was cleaning out the basement under the stage in the 2000 seat theater that I work at, when I noticed the large pile of Obsolete and Broken lighting fixtures in the corner destined for the dumpster. Suddenly I realized how much glass that is available from the lenses of those lights. So I started taking apart the lens tubes and harvesting some thick glass. 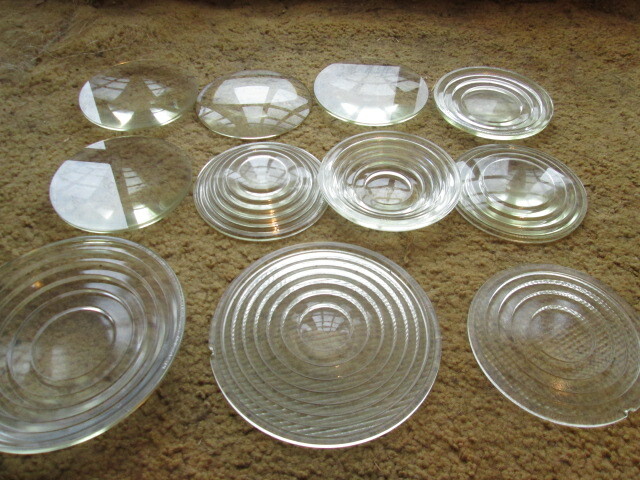 Some of them are Fresnel lenses that have thick sawtooth ridges molded in circles around the lens and some are parabolic shaped. 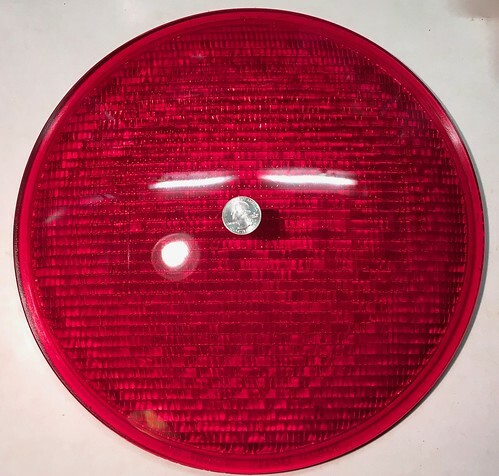 A short time later I noticed a large pile of roundels which are disks of colored glass used to color the lights in lighting strips over the stage. These were stacked up just for the taking. The lighting fixtures these belong to were thrown in a dumpster during a remodel we did 6 years ago. They are Red, Blue, Green and Yellow. Some are totally smooth and shiny and some have lines or bumps on the surface that control how the light spreads out. These are 7 3/16 inch diameter and slightly less than 1/4 inch thick judging by this one which was broken when I found it. Just got these home at midnight and just now making plans on what I am going to do with this stuff. Cut it up and tumble it. Perhaps cutting pendant size pieces. Drill hole for attaching cord. 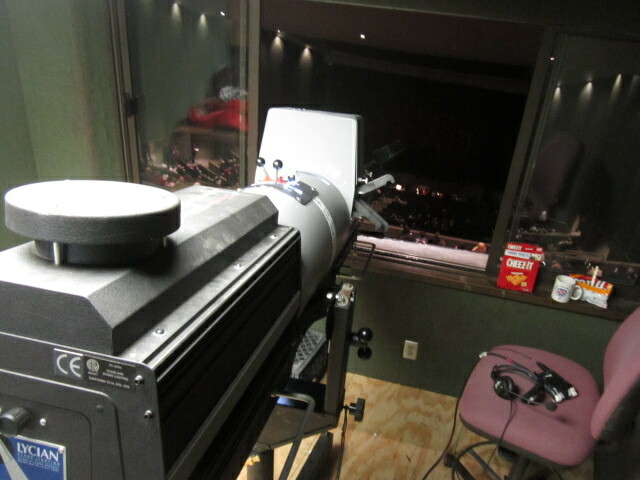 Working another day running Spotlight for The Sound Of Music. 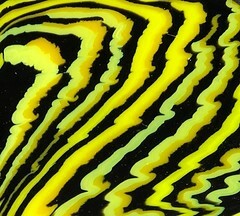 These are the same type of glass used in traffic and railroad signals. I have a 4 color set picked out for Jamesp, waiting here at the house, the smooth ones. Anybody else want any ? 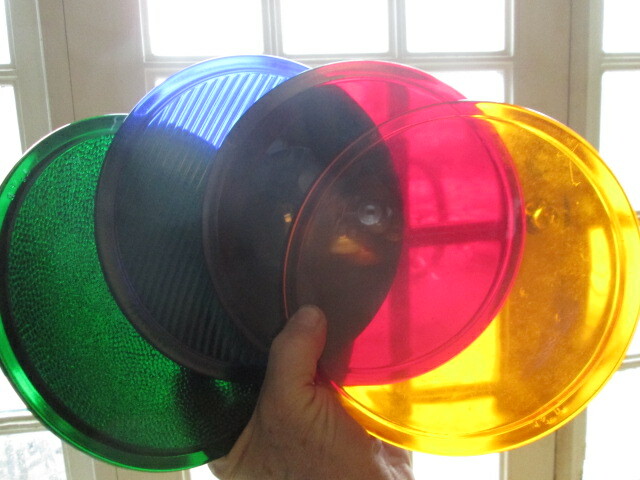 She bought a set, red yellow green, about 11 inches across. They may be old. Betcha $100 yours are made out of pyrex since wattage is high(spot light HAS to be hot as hell) and rain hits the lenses. They probably cost a fortune. 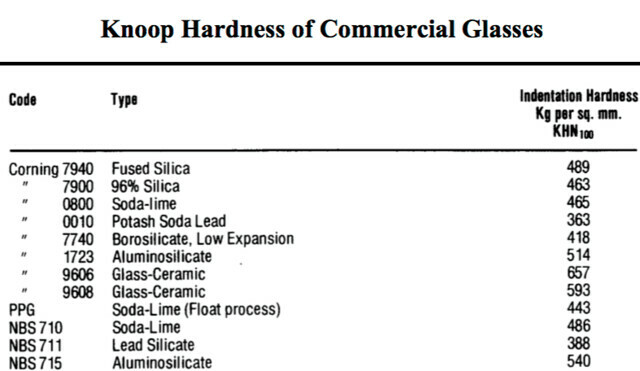 Glass varies a lot in hardness. 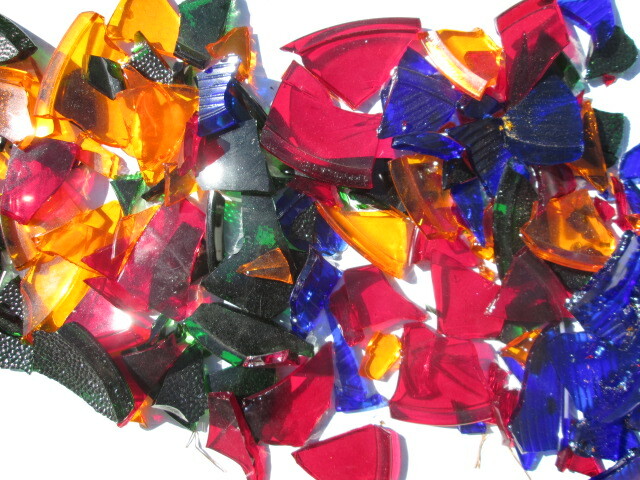 I get various polish quality in a load of mixed glass. Softest at 363, hardest at 657 Knoop hardness scale almost half as hard. I probably tumble soda glass for the most part. Middle of road at 465 Knoop. 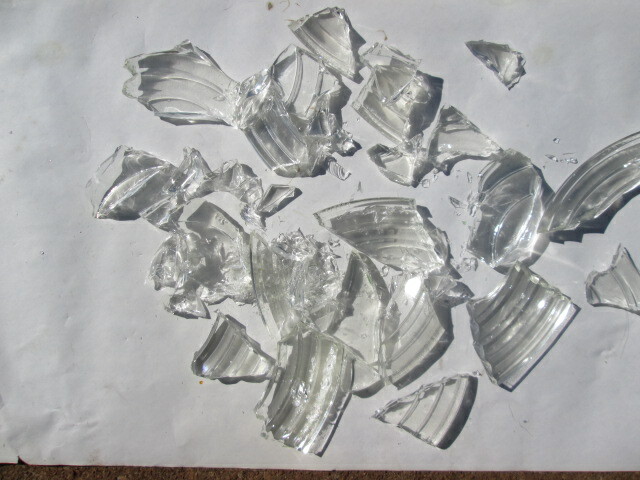 Bottle glass can be darn hard, tempered table top glass real soft. You can tell when coarse grinding, some rounds much quicker. No idea what the harder glass-ceramic is. Lenses for cameras are made of borosilicate glass, some glass artist use borosilicate. It is soft, I think it is used because the bubbles rise out of it easily. When you coarse grind your lenses you should throw some bottle glass and other type glass in with the load and watch which round fastest. According to their website . . .
Borosilicate glass is a strong and durable material that is well suited for harsh environments. 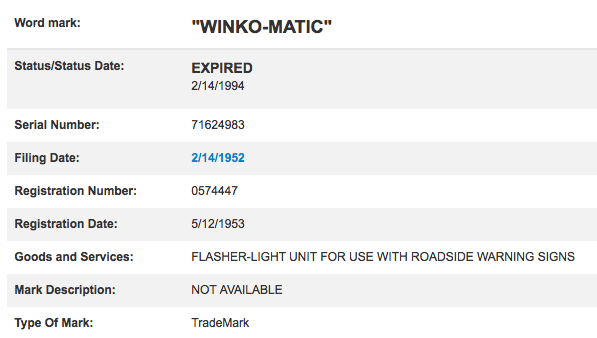 Long exposure to ultraviolet light, chemicals, salt, and other abrasive materials has little to no effect on it. Off course it will tumble. With the same PIA frost and bruise issues all glass is famous for. Again, betcha it is some expensive high quality glass. Kopp a high tech operation. Can't find this info. a professor at engineering school said that glass is one of the strongest materials known in resisting slow bending of all materials IF IT IS NOT scratched. As soon as you drag a glass cutter across it it reduces its strength like 1000's of times. Polished glass with no scratches is freaking strong in resisting bending forces. Glass is a weird substance. Got the funky properties. Not wanting to make money but trying not to lose any. I messaged both of you and talked to MrP on the phone minutes before spotlighting another performance of Sound of Music. While we are here let me teach you how to run a spotlight and show you my Main Job at the Von Braun Center in Huntsville Alabama, a large complex with Ice Hockey, 2000 Concert Hall, 360 seat theater and about 10 Exhibit/Dinner spaces. Last week we did 5 sold out performances of The Sound of Music, 2 hour 45 minutes with intermission in the Concert Hall. Barely enough time to log onto the forum. 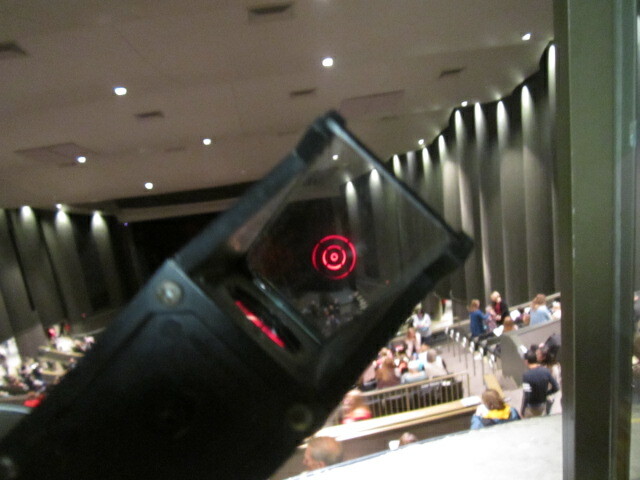 I was operating a spotlight and doing equipment maintenance before the show. 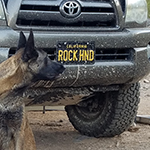 Here are some pictures I made on the 4th show. 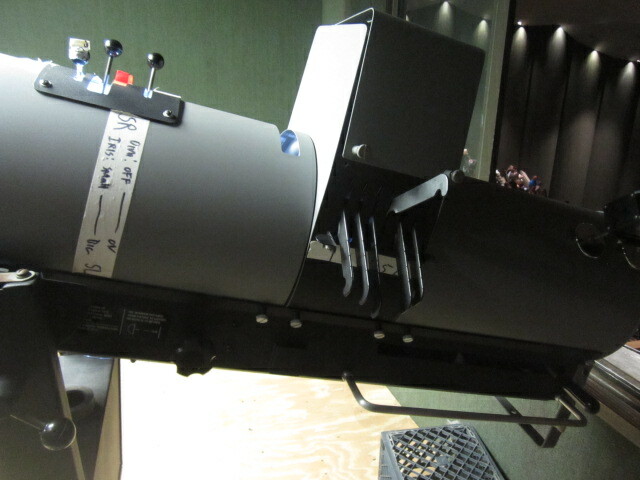 Here is the spotlight I was operating. it is about 7 feet long and 150 pounds without the base. It is a 2000 watt high pressure xenon bulb in there and makes the color of Sunlight. In this picture the spotlight is reversed 180 degrees from normal so I could get good lighting. 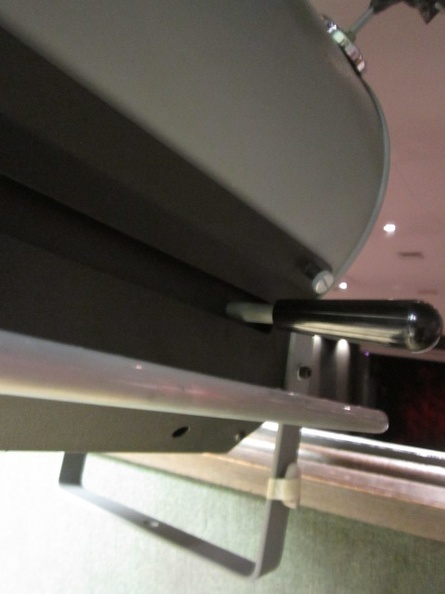 Here it is positioned normally, all the way back and at the top of the balcony, in a small booth all to myself. There are 2 more booths like it so there are 3 spotlights total. 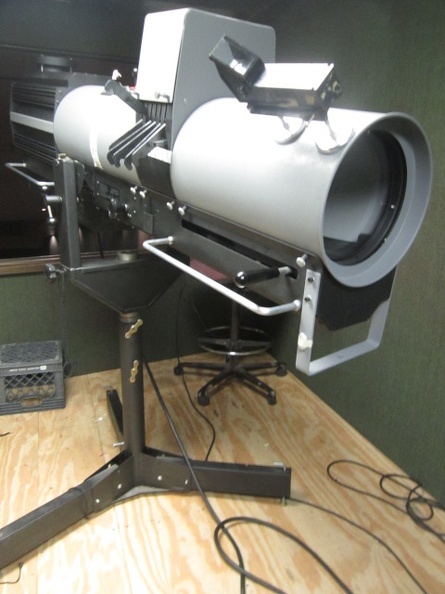 I sit in the stool very close to the light because I need to see through the Telrad (spotsight) so I can be aligned to the target before bring up my intensity. I wear the headset and communicate to a person that tours with the show and gives me detailed instructions about the Target, Intensity, Fade Time, Color and Size. I like to have handy snacks for my short breaks where intensity is Zero. During the show all lights are off except the stage. This is what I see in the Telrad, it is a small Heads-Up display so I can precisely line up on the target before fading the light on. An art form, often wondered about the behind the scenes light job. In theater the light man has a lot of responsibility. Quite a light canon you man woofer. I'll run the wires and build your stage but do not give me real time charge, too much pressure. Last weekend wife called from New Jersey antique shop asking how many of theses to purchase for tumbling. You carrin on w/my wife woofer ? Looks like the prisms are at about 20 degrees to horizon to bend light to on coming traffic. Sunday is normally cleanout day but 4000 people needed me that day so cleanouts occured a day late today. 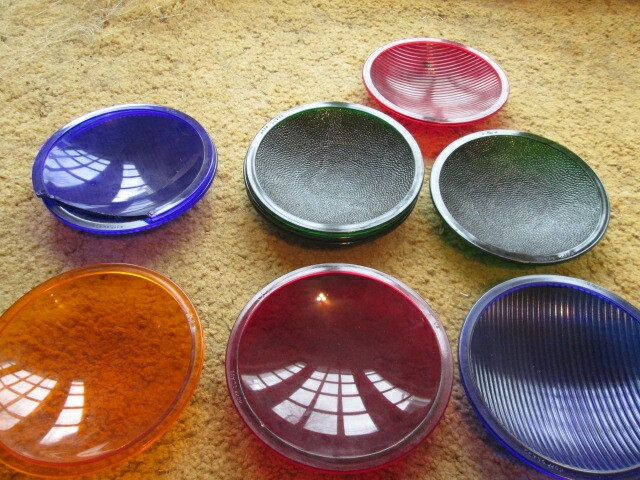 Abandoned the rocks that were rolling and decided to roll the 4 colors of theater glass that are now available. Placed the Roundels in a One Gallon freezer bag and hammers a chisle at them trying to make 1 or 2 inch pieces. They filled a 6 pound barrel really good so it's all running. Used raw Ungraded SiC and some slurry thickiner. Also busted up a clear parabolic fresnel lens but there was not enough room to add it this time. Thanks for the peek behind the curtain Woof. I've always wondered about it too - are you working off any kind of a script or does the show guy feed you cues the whole time? Usually the person that Calls the ques, travels with the show and also operates one of the spotlights at the same time. They execute the ques that are the most important or complicated while calling out ques for the other spots. We have a meeting before the first show to talk about the hardest ques and the style that they use to call out the ques. 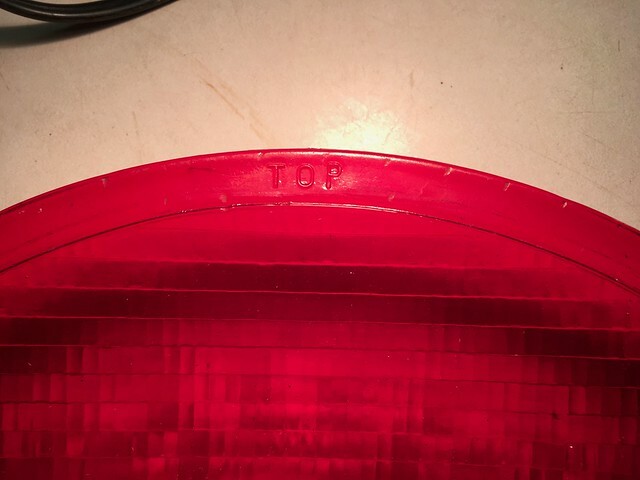 Spots have a number, colors have a Frame number, Targets have a name or stage position or a description of the clothing. During the first performance the ques can be very detailed, after we do it once it is much easier and less difficult as each show goes by. All the instructions are given to all the spots and then executed an a GO call. During times when spotlights aren't needed, we tell jokes and make fun of the show.